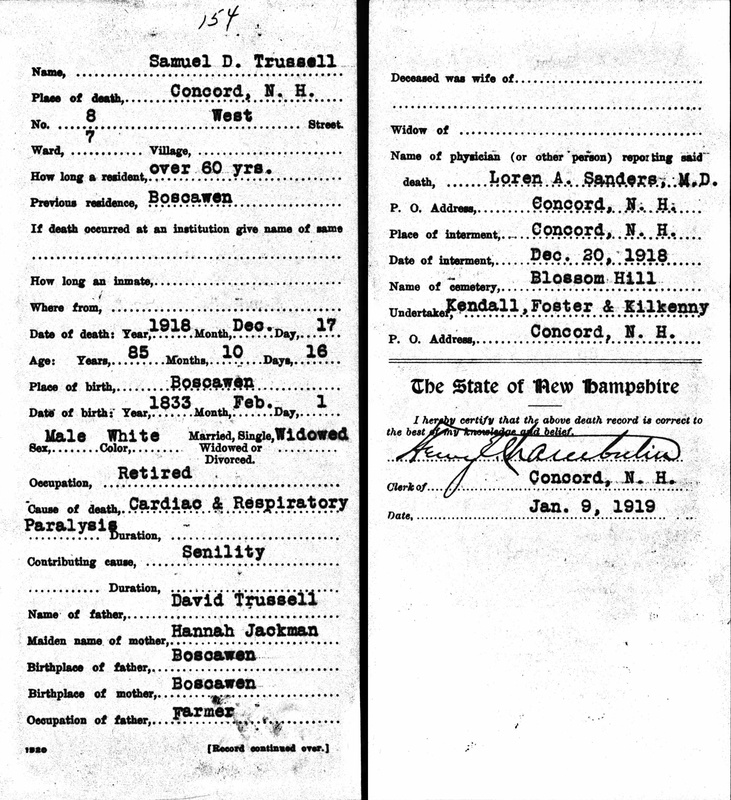 "New Hampshire Births and Christenings, 1714-1904," database, FamilySearch (https://familysearch.org/ark:/61903/1:1:FDF3-4B5 : accessed 4 April 2016), Samuel Dinsmore Trussell, 01 Feb 1833; citing Boscawen, Merrimack, New Hampshire; FHL microfilm 2,259,646. 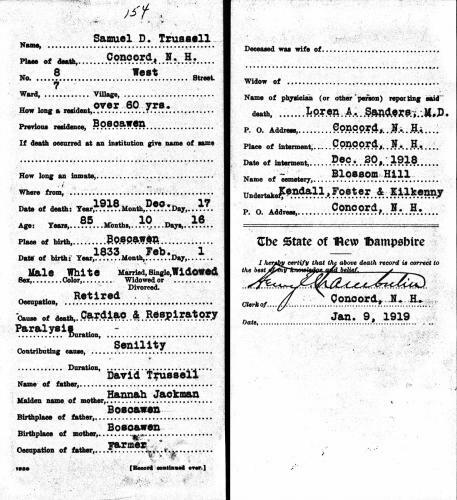 "New Hampshire, Birth Records, Early to 1900," index and images, FamilySearch (https://familysearch.org/pal:/MM9.1.1/FL5G-R26 : accessed 24 Apr 2014), Samuel D Trussell, 01 Feb 1833; citing Boscawen, Merrimack, New Hampshire, United States, Vital Records and Health Statistics, Concord; FHL microfilm 1001049. “New Hampshire, Marriage and Divorce Records, 1659–1947.” Online index and digital images. New England Historical Genealogical Society. Citing New Hampshire Bureau of Vital Records, Concord, New Hampshire.,. 1880 United States. Census Office. 10th census, 1880 federal population census, Washington, District of Columbia: National Archives and Records Service, ([19--]) , Census Place: Concord, Merrimack, New Hampshire; Roll: 766; Family History Film: 1254766; Page: 216B; Enumeration District: 173; Image: 0262. "United States Census, 1900," database with images, FamilySearch (https://familysearch.org/pal:/MM9.3.1/TH-267-13033-186302-81?cc=1325221 : 5 August 2014), New Hampshire > Merrimack > ED 158 Concord city Ward 7 > image 25 of 38; citing NARA microfilm publication T623 (Washington, D.C.: National Archives and Records Administration, n.d.). 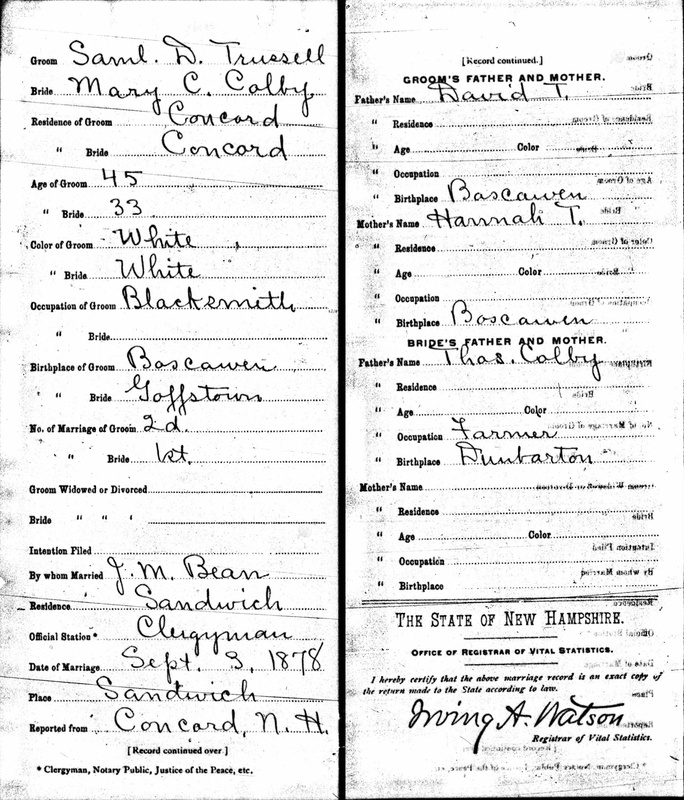 “New Hampshire, Birth Records, through 1900.” Online index and digital images. New England Historical Genealogical Society. Citing New Hampshire Bureau of Vital Records, Concord, New Hampshire.,. Abigail Tucker was born perhaps about 1716. Abigail Tucker was born perhaps about 1718. Dorcas Tucker was born perhaps about 1714. "New Hampshire Marriage Records, 1637-1947," database with images, FamilySearch (https://familysearch.org/ark:/61903/1:1:FLXF-B98 : 12 December 2014), Leonard T. P. Colby and Ella M. Hodson, 30 Jun 1888; citing Plymouth, Grafton County, New Hampshire, Bureau of Vital Records and Health Statistics, Concord; FHL microfilm 1,000,976. 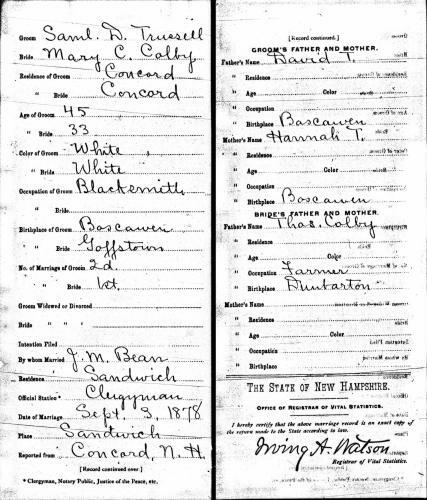 "United States Census, 1900," database with images, FamilySearch (https://familysearch.org/ark:/61903/1:1:M3Y7-PRK : accessed 29 November 2016), Leonard T P Colby, Plymouth town, Grafton, New Hampshire, United States; citing enumeration district (ED) 72, sheet 3A, family 48, NARA microfilm publication T623 (Washington, D.C.: National Archives and Records Administration, 1972. ); FHL microfilm 1,240,946. Vital records of Gloucester, Massachusetts to the end of the year 1849, Salem, Mass. : The Essex Institute, (1924) , p. 312. Burton W. Spear, Search for the passengers of the Mary & John, 1630, Vol. 5-8, , at https://books.google.com/books?id=XDohAQAAMAAJ . Toledo, Ohio: (1999) , p. xlix. Vital records of Gloucester, Massachusetts to the end of the year 1849, Salem, Mass. : The Essex Institute, (1924) , Vol. 1, p. 731.